The vegetarian stuffed cabbage rolls are healthier because they are stuffed with fresh vegetables and I have added Turmeric Powder to make it even more crazy tasty! Turmeric helps reduce the buildup of plaque in the arteries that leads to heart attack and stroke. A study from the Journal of Nutrition and Metabolism showed that turmeric is essential for blood vessel health, which is an important aspect of heart health. Turmeric is also a powerful remedy against depression, according to a new review of over 100 studies. Add this to the now immeasurable number of turmeric benefits. 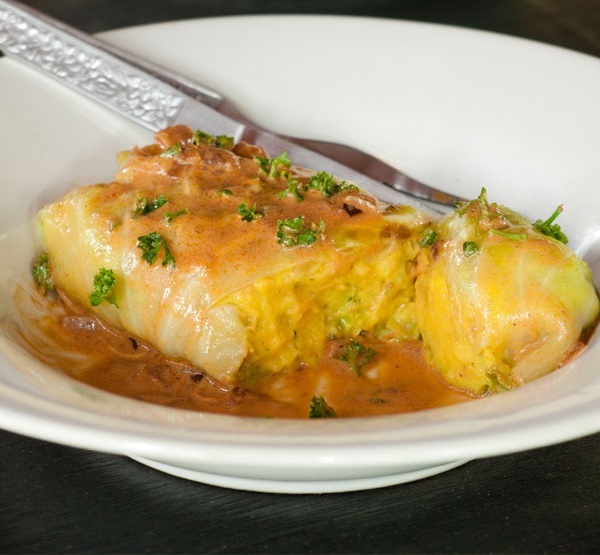 The German-inspired, healthier vegetarian stuffed cabbage rolls are prepared from scratch with fresh ingredients. I recommend to serve them with the sauce in this recipe! Tip: You can substitute the broccoli with cauliflower too. Peel your potatoes and carrot and cut them into small dice. Cut the Broccoli into smaller pieces. Cook the veggies until al dente/not too soft. Peel the Onion and Garlic and chop. Fry with some oil for a short time and keep aside. Strain veggies (keep veg stock aside for later) and separate potatoes from carrot and broccoli. Place potato in the pot and add the milk and butter. Heat up the pan and mash the whole content well. Place the pot on the stove and cook, add the broccoli & carrots to the mash, season with turmeric powder, nutmeg, salt, and pepper and throw in half amount of the previously fried garlic and onion from step 2 (the other half will be required for the sauce). Mix the stuffing well! Remove from the heat and keep aside to cool a bit. Add some water to a pot, heat it up and place the cabbage leafs into the water. Allow them to cook for 8 minutes. Take them out of the water once they are soft and cool them shortly under cold water. Place one big cabbage leaf on your working space and place a small cabbage leaf or half of a big leaf on top. Add 1-2 Tablespoons full of stuffing into the center. Now wrap by pulling the side leaf parts into the center. Then gently fold it in on top and down as well. Keep on holding it together! Take a kitchen thread to hand (about 60 centimeters long). Hold on your roll parcel and turn it top side down. Take the string underneath the parcel and take it back up, lock the two strings and take the string lengthwise, turn the parcel and lock again the 2 strings with each other. Come back towards the other side and make a knot. It's just like parceling a gift! Take the rolls out once finished fried and place the previously fried onion and garlic into the pan. Add the leftover veg stock from earlier (about 180 milliliters), the heavy cream, the Tomato Paste and season a bit with salt and pepper. Cook for 3 minutes until done.